The goal of the IoT Large Scale Pilots (LSP) Programme is to foster the deployment of IoT solutions in Europe, demonstrate their feasibility and benefits and promote the development of a sustainable IoT ecosystem. The projects design and apply IoT approaches to real-life challenges of high relevance, technology readiness and potential socio-economic impact for Europe. 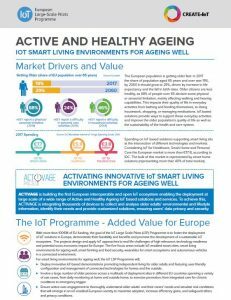 IoT smart living environments for ageing well represent one of the key focus areas in the framework of the IoT LSP Programme. 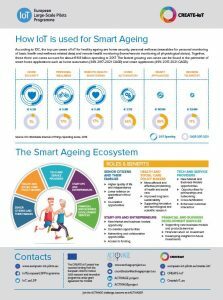 According to IDC, the top use cases of IoT for healthy ageing are home security, personal wellness (wearables for personal monitoring of basic health and wellness-related data) and remote health monitoring (home/remote monitoring of physiological status). Together, these three use cases account for about €11.8 billion spending in 2017. The fastest growing use cases can be found in the perimeter of smart home applications such as home automation (34% 2017-2021 CAGR) and smart appliances (49% 2017-2021 CAGR).